A group of western European peoples emerging about 500 BC, probably from the Rhine region of Europe, and including the pre-Roman inhabitants of Britain and Gaul and their descendants, esp. in Ireland, Wales, Scotland, Cornwall, Brittany, and the Isle of Man. Known especially for their distinctive art styles, including spirals, key patterns, knot work forms and animal patterns. Originally pagan and spiritually led by the powerful Druids, the Celts began to be converted to Christianity by around the 1st Century AD. At the Synod of Whitby in 664, they broke away from the Roman Church to form their native Celtic Church. 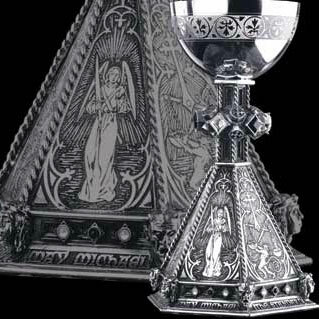 This truly magnificent craftsmen made pewter chalice weighs a full 2 ½lb (110g) and stands an imposing 9 ½" (246mm) high. Its implicit theme is in commemoration of the Archangel Michael's victory over Satan on the Day of Judgement in the Biblical 'War in Heaven', while its form was inspired by an original C19th design by the inimitable A. N. Pugin. The elegantly shaped bowl has been spun then mechanically engraved while the stem, its large and intricate knop and uniquely proportioned base are formed from eight separate, ambitious castings that are then skilfully hand assembled and soldered to become one commanding piece. Each chalice is then separately patinated and expertly hand polished before finally being set with 24 complementary Swarowski crystals. Chaostar: Also known as the Chaos Wheel or the Symbol of Eight; each of the eight arrowheads is representative of infinite energy and possibility, with the uppermost point specifically illustrating the fixed path of Law. First created by science fiction author Michael Moorcock, it is now widely used as an emblem of Chaos Magic. Chi-rho: (Greek); An acronym, also a monogram of chi (K) and rho (R) as the first two letters of Khristos (Christ), widely used in Christian symbolism and iconography in ancient times. Churriguera: An influential family of Spanish architects and sculptors from early 17th and late 18th century Madrid and Salamanca, noted for their uniquely elaborate and flamboyant style of Baroque sculpture and architecture. Their most notable work includes the exuberant design of the Colegio de Calatrava and the Plaza Mayor, both located in Salamanca. 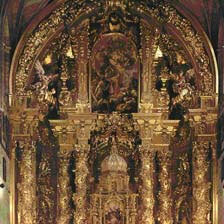 This distinctive style became known as Churrigueresque. "With my two hands I give you my heart, and crown it with my loyalty." Wearing the ring in different positions can give away the wearer’s romantic availability; for instance, worn on the right hand with heart facing outward implies that the wearer is searching for love. 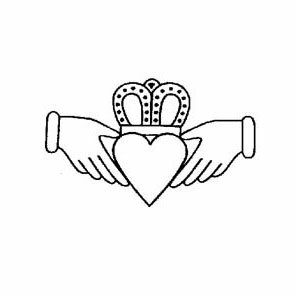 Turned inwards on the same hand, it means the wearer’s heart has already been ensnared by another. On the left hand and pointing outwards denotes engagement, while inwards indicates marriage. Coeur Sauvage: (French); ‘Savage Heart’.